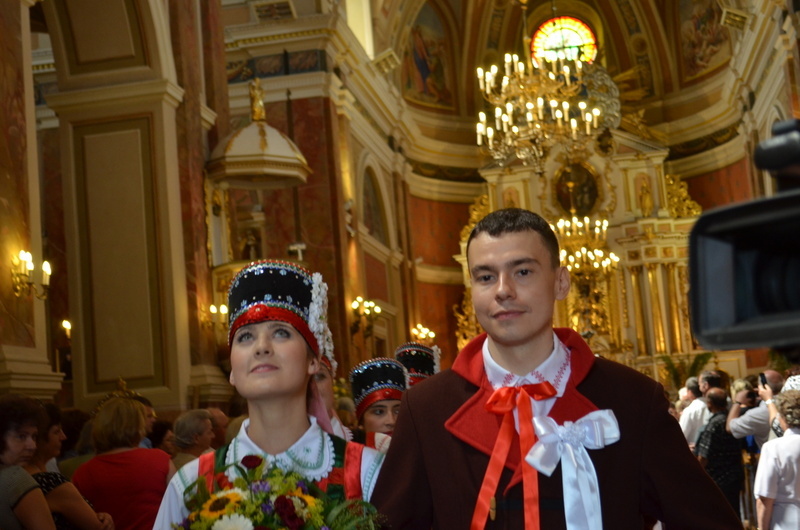 The wedding is one of the most important Polish family celebrations. First there is the engagement period called Oswiadczyny, Zareczyny or Zrekowiny. The wedding day is set up by young people. Invitation time called: Zaprosiny or Oprosiny. Wedding Day (Church and reception). Next Day party. In Poland sometimes 3 days party. The engagement ceremony comes before the wedding. The engagement is usually a small ceremony that takes place in the house of the parents or parents in law (either the bride or the groom). Usually this is a time when in-laws meet each other for the first time. Wedding traditions demanded that guests be invited in a certain obligatory manner. First, invitations were issued to relatives or friends to act as groomsmen or bridesmaids. The bride and groom then went to invite their godparents. In some parts of Poland old custom forbade the exclusion of anyone in the village from being invited to the wedding. If somebody from invited guests is unable to participate in a wedding ceremony he/she usually sends a telegram or a postcard or a gift. Some Polish brides and grooms like to celebrate the big change in their lives – the wedding – with a bachelor and bachelorette party. The bachelor and bachelorette party sometimes takes place a night before the wedding but more often – on a Saturday or Friday – a week or two before the wedding ceremony. During the bachelor party, the groom gets to go out and socialize with his male friends. They usually visit a couple of bars where they have drinks, play pool or throw darts. During the bachelorette party, the bride either goes out with her girl friends or invites the girl friends to her house for a light meal and drinks. During the party, the girls talk, gossip, play games, and listen to music. A wedding ceremony is usually both religious and civil and takes place first at a magistrate and then in a church. Before the church ceremony everyone would gather at the home of the bride to accompany the bridal couple to the church, but also to witness the blessing and symbolic farewells of the bride with her parents, relatives, and friends. The blessing by the parents before church was seen as more important than the church ceremony itself. A crucifix, a lighted candle, a bowl of holy water and a sprinkler (if the regular Polish brush-type sprinkler is not available, this can be a leafy tree branch) should be prepared. Traditionally the mother of the bride gives the blessing. Either kneelers or some cushions are provided for the bride and groom to kneel on. They hold hands as they kneel in front of their parents. The mother then sprinkles the bride and groom-to-be with Holy Water, whereupon they make the Sign of the Cross. She then gives them the crucifix to kiss. The father of the bride may utter a blessing of his own or simply sprinkle the couple with Holy Water. The bridegroom’s parents may also impart their blessing. Others, for instance grandparents, or godparents may also bless the couple. After the blessing, the bride and groom thank, hug and kiss their parents and the wedding party prepares to leave for church. Years ago, the blessings were so important that, if a mother or father had died, the wedding party would stop at the cemetery where the groom or bride asked for a blessing from the deceased parent. The Bread and Salt Blessing is an old and most popular Polish tradition. At the wedding reception, the parents of the bride and groom greet the newly married couple with bread, which is lightly sprinkled with salt and a goblet of wine. With the bread, the parents are hoping that their children will never hunger of be in need. With the salt, they are reminding the couple that their life may be difficult at times, and they must learn to cope with life’s struggles. Also it was believed that salt had the power to heal and cleanse, uncover thieves, protect houses against fire, dispel storms and hail, and drive away evil spirits. The wine symbolizes the desire that the couple will never go thirsty, and that their lives will be filled with health and happiness. After the bride and groom each taste a piece of bread they break the plate and glass for good luck. The parents then kiss them as a sign of welcome, unity, and love. Everyone would gather at the home of the bride to accompany the bridal couple to the church, but also to witness the blessing and symbolic farewells of the bride with her parents, relatives, and friends. The trip to the church takes place in various ways, with the bride and groom riding together, or bride and groom come separately. If they come separately the bride waits in the church and the groom shouldn’t see her until the ceremony starts. Father walks with the bride to the altar. Leaving the church ceremony, the bride sometimes throws handfuls of straw on the young boys and girls who followed the wedding party. Whoever it landed on was prophesied to marry before the others. Another belief was that whichever one of the bridesmaids touched the bride or her wreath first after the marriage would marry that year. After the wedding ceremony there is a time for congratulations. While the young couple leaves the church, the Wedding March of Mendelssohn or Ave Maria is played by the organist. Then the rest of the invited guests leave the church and wait, usually in a long line to congratulate a young couple in front of the church. The parents and the closest family congratulate first, later the rest of the family. Than guests usually throw small coins to a young couple, where the money needs to be picked up, mainly by guests. This is an old and pagan habit but still very popular. In the past people showered a young couple with grains or rice, usually millet for a good and prosperous future. Many young couples consider hiring a polish band / polka band, so their guests can enjoy Polish Music. It is customary to have musicians playing as the wedding guest begin arriving at banquet hall or the Dom Weselny (wedding home). Sometimes musicians are rewarded with a small tip. First toast and song called “Sto lat” which literally translated means “one hundred years”. Sto Lat, usually is sung by the guests that signifies 100 years of good health for the bride and groom. niech zyje, zyje nam, niech zyje nam…. Also there is tradition that all the guests at the reception line up or make a circle for a last chance to dance with the bride. It is customary to donate money to the newly wed couple for the privilege of the dance. Guests pin money to the bride’s wedding dress to buy a dance from her. Or the money can be put into an apron, basket, plate, or decorated box before dancing with the bride. The money collected during the dance is sent with them to spend on their honeymoon. Next day after reception party, there is a follow-up party the day after the wedding (poprawiny). This is held at the home of one of the newlyweds’ parents, especially when there is quite a bit of food and drink left over from the previous day’s festivities. This tradition is still the mainstay of many Polish brides, representing a rite of passage from young woman to married woman. All single ladies circle the bride as the maid or matron of honor stands behind the bride and removes the veil/cap (welon, czepek) from the bride’s head as music is played. A married woman is given the responsibility of pinning the cap on the bride as all married women circle around the bride. At this moment, the bride is officially considered a married woman. Sometimes, after the unveiling the bride will toss the veil, rather than the bouquet, to one of the single women or give the veil to the maid of honor. Years ago, the veil was usually a gift to the bride from her godmother. This veil/ cap was always held as special and reserved for wear to church, for special folk festivals, and on her death, for burial. Some Polish favorites are: Polish beet soup (barszcz czerwony), hunter’s stew (bigos), dumplings (kopytka), dough pockets (pierogi) roasted meats and vegetables, potatoes with gravy, meat pastries, torte and fruit bar. In addition to food, they serve Polish drinks as well, such as Polish vodka or wine. Typical Polish wedding in a village is much bigger than a wedding that takes place in a town. Since people in villages usually own a house, they can afford to invite more guests than in the towns where people usually live in apartments. In the village it is not unusual to have a wedding which last three days and nights straight. 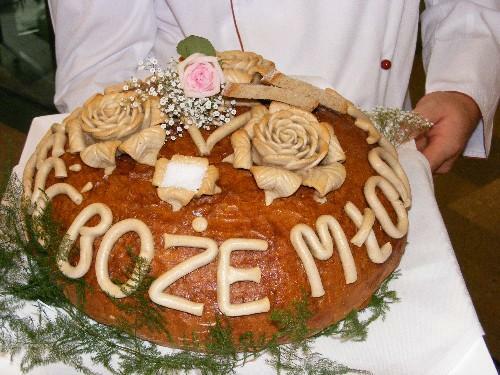 Here you can read learn about the Serbian wedding traditions.